Edith C. Bialzik, 97, formerly of Port Washington and Fredonia, died peacefully August 13, 2013 at Gables on the Pond in Random Lake, Wisconsin where she had resided for the past few months. 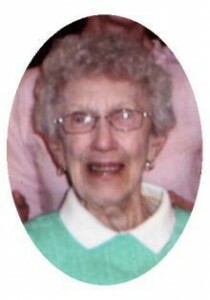 She was born April 23, 1916 in Milwaukee, Wisconsin to Paul and Clara Gall Kuklenske. She graduated from Mount Sinai Nursing School in Milwaukee and started working as a school nurse in West Allis. On December 17, 1941 she married Francis “Frank” Bialzik at St. Matthew’s Catholic Church in Milwaukee. He served in the Army during World War Two and upon his return, the couple moved to Belgium, Wisconsin where they resided for 17 years, before moving to Fredonia for 34 years. Edith started working as a general duty nurse at the former St. Alphonsus Hospital in Port Washington. She retired in 1984 after 20 years of service. In 1997 they moved to Florida and returned to Ozaukee County in 2000. For about ten years, Edith called Lincoln Village of Port Washington home. She was a member of St. Rose Church in Fredonia and its Ladies Sodality. She was very active with the Port Washington Food Pantry and enjoyed volunteering and sharing of her time and talent. She was an avid reader and enjoyed gardening. Upon retirement; family, travel and golf kept her busy. Her husband Frank preceded her in death March 6, 2002. She is survived by her children Claire (Don) Galles of Palm Coast, Florida; Patricia (Jack) Griffith of Palm Coast, Florida; Gregory (Teresa) Bialzik of Highbridge, Wisconsin; Paul (Katie) Bialzik of Cedarburg; John (Joan) Bialzik of Whitney, Texas; Robert (Barbara) Bialzik of Hatley, Wisconsin; Marilyn Hawe of Oostburg and Ruth (Bill) Leider of Belgium. She is further survived by 16 grandchildren, 23 great-grandchildren, nieces, nephews, other relatives and friends. She is preceded in death by her parents, husband Frank and three sisters Alice Kuklenske, Marcella Bliemeister and Delores Jacobowsky. The Reverend Todd Budde will celebrate her Memorial Mass of Christian Burial 11AM Thursday, August 22, 2013 at Divine Savior Parish – St. Rose Chapel, 305 Fredonia Avenue, Fredonia. Family will receive friends from 9-11 AM Thursday AT CHURCH. Interment will take place at St. Mary’s Cemetery, Lake Church. Memorials to the parish or Port Washington Food Pantry appreciated.